Let&apos;s just get something clarified first: the previous generation BMW 6-Series was a polarizing design that didn&apos;t age very well. It was definitely a different approach from the more traditional BMW styling, but, man it was ugly. Fortunately, the flame surfacing theme from the Chris Bangle design era is now in the past and current design chief Adrian van Hooydonk has taken a softer, more layered approach. In other words, the BMW lineup is currently going through a styling makeover. And for the 2012 6-Series, van Hooydonk&apos;s elegant lines are a welcomed and much needed change. Translation: the new car is now de-Bangled and pictures alone don&apos;t do it justice. It&apos;s sleek and looks like it&apos;s going fast even when at a complete standstill. And your eyes aren&apos;t fooling you, as it&apos;s lower than before and the height is even slightly decreased. The crisper look is accentuated with various aluminum and steel body panels and plastic composites. And like before, the 650i Convertible is a heavy thing, weighing in at nearly 4,500 lbs. It&apos;s larger than the Jaguar XK and the Mercedes-Benz E-Class Cabriolet because of its chassis, which is derived from both the 5 and 7-Series sedans. As a result, the 650i is 2.6 inches longer than the outgoing model. Fortunately, BMW has made sure the base engine is able to handle the extra bulk. Equipped with a twin-turbocharged 4.4-liter V8, it produces 400 hp and 450 lb-ft of torque. Amazingly, that&apos;s an additional 40 hp and 90 lb-ft of torque more than the old engine. Power is fed to the rear wheels via a six-speed manual or an eight-speed automatic transmission. Ironically, the six-speed will only be available in the U.S and not in Europe. Going from 0 to 60 mph takes about 4.9 seconds with either transmission. Top speed is limited to 130 mph (150 mph when equipped with the optional Sport package). And although it&apos;s heavier and the engine is more powerful, BMW has made sure the new powertrain is more efficient than before. Official EPA ratings haven&apos;t been released yet, but BMW promises it will be an improvement over its fuel-sucking predecessor, which managed just 15/23 mpg city/highway. And because this is BMW here, there are high-tech goodies nearly everywhere. The double-wishbone front suspension and multilink rear setup are constructed mainly from aluminum and buyers can also choose BMW&apos;s Active Roll Stabilization, which utilizes sensors that calculate the amount of body roll and then counteracts it through hydraulic actuators in the sway bars. There&apos;s also the optional Integral Active Steering. This enables rear-wheel steering that supposedly enhances maneuverability and high-speed stability, such as lane changing and a significantly tighter turning circle. Like before, the top features a "flying buttress" roof design, which has a glass window that can be lowered separately from the canvas roof. Lowering the roof takes just 19 seconds and 24 seconds to raise and both functions can be done up to 25 mph. The technological extravaganza continues inside with standard 20-way multi-contour front seats and surprisingly comfortable sculpted rear seats. Rear legroom has also been improved. The dash is also now more "driver-centric," and the center stack has been refined. An improved iDrive returns along with a new color display integrated into the instrument cluster. Like the iDrive screen, it features BMW&apos;s "Transreflective" technology to reduce glare. Other standard features include a rearview camera, LED foglamps, and adaptive xenon headlamps. A few options include a multiangle top and side view camera systems, advanced adaptive cruise control, and a 12-speaker audio system. 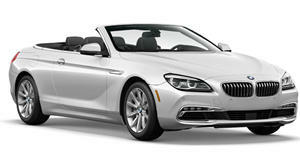 With pricing starting at $91,375 (a nearly $5k increase over the previous model), the 650i Convertible is hardly cheap. Fortunately, it continues to be loaded with high-tech toys and gadgets while also being a fantastic driver&apos;s car. And it&apos;s even pretty now, unlike the previous Bangled beached shark.